Gift Giving is a complex and ubiquitous task that would benefit from the simpler and more user-centred style of interaction offered by the Personal Web vision. In this paper we begin by reviewing relevant literature on gift giving, and we identify key roles and requirements of gift giving. We examine current approaches to the support of group gift giving online and review some of their deficiencies. We then discuss the role that recommender systems and social media can play in facilitating gift giving interactions. 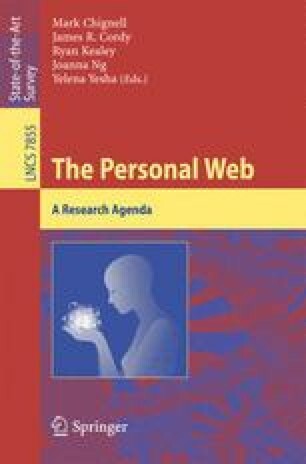 As a first step towards simpler and more effective group gift giving in the Personal Web, we review results of research studies that we have conducted showing opportunities and challenges with respect to further development of gift giving online communities, and group gift giving services. We conclude with suggestions on future directions for online group gift giving noting the contribution that the Personal Web approach can make in this domain.